The Town of Chapel Hill’s North-South Bus Rapid Transit project began as a 30-month study to identify and evaluate a series of transit options for one of the town’s busiest corridors and most vital thoroughfares, which runs along the Martin Luther King, Jr. Boulevard, South Columbia Street, and US 15-501 South. This corridor, which is approximately 8.2 miles long, begins in the north at the Eubanks Road park-and-ride lot and ends in the south at US 15-501 at the Southern Village park-and-ride lot. 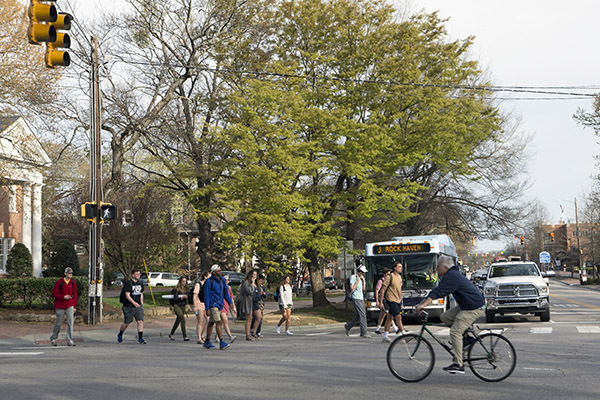 The planning study began in 2013 and concluded in 2016 and was led by Chapel Hill Transit in coordination with its partners, the Town of Chapel Hill, the Town of Carrboro and the University of North Carolina – Chapel Hill. The study phase, which included public involvement and feedback, resulted in four key findings. Current station locations should be reviewed. The combination of fewer stations, dedicated lanes and traffic signal priority will result in time savings along the corridor. The N-S BRT must provide direct connection to UNC Hospitals & the proposed Durham-Orange light rail system. The N-S BRT must include exclusive lanes for buses wherever possible. In a few limited areas, targeted lanes are not feasible. However, dedicated lanes will be used when possible. Based on the key findings and feedback from the public, three versions of the same alternative have been identified as the LPA. The variations are related to dedicated lane configuration (use of curb or center dedicated lanes, either newly-constructed or conversion of an existing lane to transit-only). These variations occur north of Hillsborough Street. Carrying these variations into the engineering and environmental clearance process will enable the community to better understand the benefits and impacts of each and will help to inform the detailed design and decision-making process. Consider the feasibility of extending BRT service north to the Durham Technical Community College in Hillsborough. Develop design of the N-S BRT to 30 percent. Provide a transparent public involvement process that will engage the diverse members of the corridor through traditional and innovative methods.